There is only one item that brings joy, happiness and ecstasy. We all want it, crave it, worship it and are addicted to it. Fine - maybe not all - but most of us are. I can honestly say I am the ultimate chocolate addict. So, it might not come as a surprise that I decided to participate in Death By Chocolate organized by Culinate. This event could not have found a more suitable participant than me that's for sure. 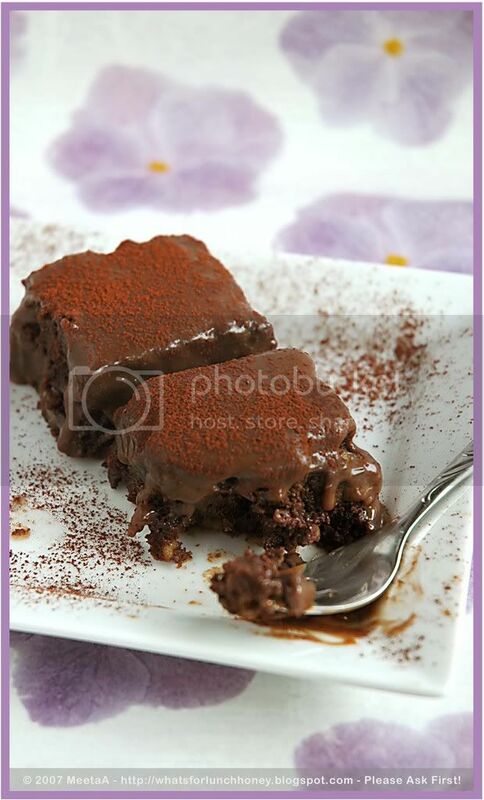 There is a huge variety of chocolate recipes here, each one more decadent than the other. However, I thought the one recipe that really deserves the "Death by Chocolate" title are my rich chocolate mocha brownies. Remember those? Moist and crunchy with the added walnuts. Well now that I am one of the many participants I need your help. This is where the fun comes in, as you have a chance to win something too. All you need to do is go on over to the voting page and give your vote. Two winners will be picked: one is the entry with the most votes the other is a reader chosen at random from the voters in the contest. What can you win? A fantastic trip to Napa Valley, California, to the ultimate chocolate tasting experience, the Death by Chocolate Festival. Have I got your attention now? Thought so! Register yourself on the Culinate contest page. This automatically gives you a chance to win. On February 4th come back and vote for your favorite chocolate post. Contest closes February 8th. After that a panel of esteemed judges will select the winning chocolate entry from the top 10 vote-getters. So, please go on over and vote for me in the Death by Chocolate contest and for those deliciously chocolaty mocha brownies! thats a divine one Meeta..I am just heading over there!...all the best! Well you can serve me up this brownies any time. I wanted to vote but when i click to the link yougave i don't get connected. So will try later. Looking delicious! Good luck with your entry! These brownies look so moist and extremely chocolatey. Excellent entry for the Death by Chocolate contest Meeta!!! I had tears falling from my eyes when the picture of this delicious treat appeared on my screen!! I don't know how it taste like but i can imagine. Meeta, I missed your lovely posts and photos so much. Wow, this is a wonderful brownie. I just love this very moist aspect. Good luck!! You are so right: we love it, crave it and are addicted to it. Too true. Absolutely you have my vote! I posted the centerpieces for January and we missed you. I know you'll have something special for valentines! haha, even though I don't eat chocolate, that dessert certainly does look like pure bliss!! those look magically delicious. good luck! Looks delicious and now I'll be craving sweets all day at work. Fingers crossed for a win! Thanks everyone for the well wishes. Living in Germany I am not sure if I will be chosen but the cool thing is by voting you all have gotten yourself a chance to get your hands on the prize. So good luck!